So I've been commissioned to make a baby quilt for a friend whose daughter just had a little boy, and I'm excited to get started. The pattern has been decided upon (chevrons) and the color scheme (primary-ish). I've heard the baby's room has a vintage Pac Man theme. Does that sound cute or what? I would love to be able to find some of this fabric to incorporate into the quilt. It's called Ghost Geo by Timeless Treasures and it's apparently out of print and out of stock everywhere I've looked. I'd be happy with a quarter yard (not a FQ, but a true quarter yard), if I could find it. Does anyone have any in their stash they'd be willing to part with, or know whether it's still available at your local quilt store or an online shop? I'm willing to pay a reasonable price plus domestic postage to me in WI. If don't find any in the next couple weeks, I'll happily go ahead without it, but thought it doesn't hurt to ask. Last evening, I did some fusing of the feathers (or leaves; tomato-tomahto) onto the Tea Towel Challenge Quilt. Doesn't it look like the barnyard exploded? Like BAM! What just happened? Maybe someone threw a tomato at the hen house or who knows what mayhem is in the works. I'm sure everything will be all right, though. Anyway, the thought made me giggle. It adds a fun element to the control of such a stylized tea towel, while still seeming to maintain overall symmetry. Eegads, listen to me, talking out of my tail feathers! Anyway, I think it's good to ruffle a few feathers here and there. Shake things up, rock it out. I was watching American Idol as I stood at the ironing board last night. Contestant Caleb Johnson knows what I'm talking about. I think I enjoyed watching judges Jennifer Lopez and Keith Urban really get into the song at about the one minute mark, as much as anything, but the kid has got some pipes! Linking to Really Random Thursday at Live a Colorful Life. I like your tea towel! I do not have any PAC MAN fabric however! Good luck finding it! I actually have some of that fabric but I used part of it in a project. I could part with a piece about 18 x 27 inches if you think that would help. Sadly, no Pacman fabric, or I would gladly send it your way. That tea towel is getting really fun! Oh yeah, strong voice on Caleb. I hate it when I can't find what I'm looking for. Like a lot. I hope someone has some to send you. I did an search, hoping that I could find some hidden corner of the interwebs that had exactly what you were looking for. My search yielded, of all things, a reusable menstrual pad keychain covered in that fabric. What the what? Reusable? And you keep it on your keychain? Does she sell industrial strength stain remover, too? I guess you really can buy anything on the internet. So, Harry Connick Jr. is a judge on American Idol? Maybe I should watch. P.S. I was so distracted by the keychain I forgot to say that I love how your tea towel challeng is coming along! Yay you! What a great theme for a baby boy. Bet you will find more of that fabric too! i love making baby quilt...if i make it to my lqs this week, ill check for it! Fun fabric for your commission quilt! Sounds as if there are a few out there in cyberspace who can let of a bit. Loving your tea towel challenge...'tis so much fun!! Hey Stranger! Your Towel quilt is looking great. 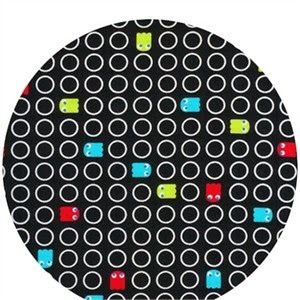 Good luck with your pac man fabric. Happy Spring!